Today we bring you an interview with Allegra Ceci, Archive Materials Coordinator at Coach Leatherware Company, and graduate of our program. 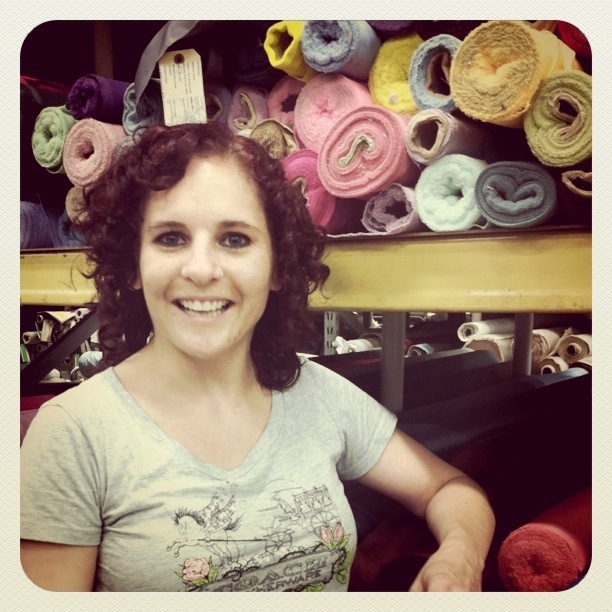 Allegra Ceci: As archive materials coordinator, I manage the archive of fabric and hardware. 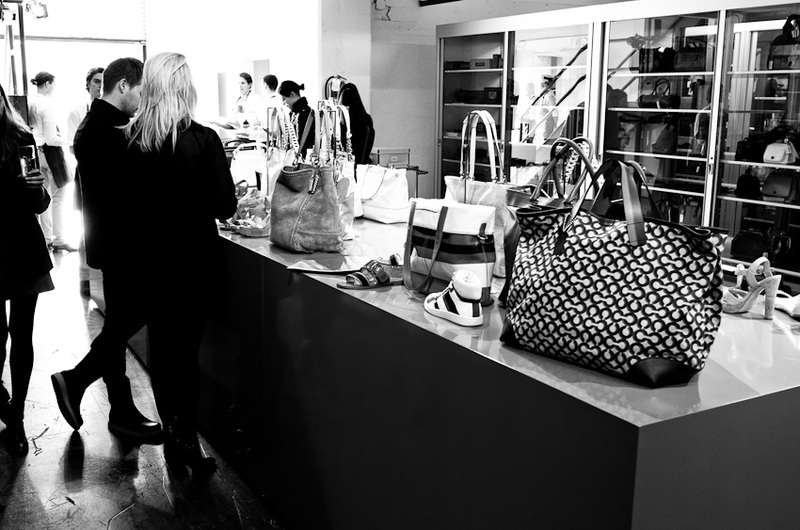 At Coach we also have a product archive of samples of bags and smaller leather goods, going back to the early 1940s when the company started. The archive was built out to include hardware and fabric swatches, blankets, and yardage. KBH: What are your responsibilities? AC: I work with designers on inspiration, if there is something they want to put on boards for creative presentation, if they want to look on a sample of color. I also work with the fabric engineers who want to revisit something they once made, or run again, or do in a different color or in a cheaper fabric content. KBH: After graduation, what was the path that led you to the job you have today? AC: When I started the program at FIT I wanted to do costume design, I did some freelancing in theater doing wardrobe, and I hated it. I thought I’d love it, but I didn’t like it at all. Then I got an internship working at Calvin Klein, helping them organize their archive. It turned into a full time job and then downsized to a part time job. I did that for almost five years. From there I moved to Coach about a year and a half ago. KBH: While you were in school, did you imagine yourself working in a corporate archive? AC: No. I knew the program has a focus on museum background, which I liked, because I love historic costume and textiles, but I never thought I will be doing an archive job, especially in a corporate environment. It is interesting that a corporate archive is very product driven, so the archive exists for the sake of history only in part, the other part is to generate revenue for the company, indirectly. One of the problems is that archives take money from the company, they do not make money. They don’t generate money like retail does, so a corporate archivist must find ways to support the company and the development of products, at the end of the day it is always profit driven. KBH: What does your day- to -day work entails? AC: Our archive is totally internal, so mostly I do cataloguing and manage loans for Coach employees. Someone might come down and they want to see everything we have done in nylon in the past two years. So we pull out everything in nylon and they take what they want, and I check it out. KBH: How do you think the program prepared you for the job you do now? AC: It made me appreciate order and being very organized. Being super- super detail oriented, almost obsessively detail oriented, is very helpful when you have huge collections. It also helped me to notice the details of the collections, how it can change and to know how to keep things organized. It is very important when you have large collection like the Calvin Klein Archives of about 50,000 objects and Coach Archives which in the fabric archives alone include about 20,000 swatches and 1,000 pieces of hardware. KBH: Is there a specific object from the Coach Archive you particularly remember or like? 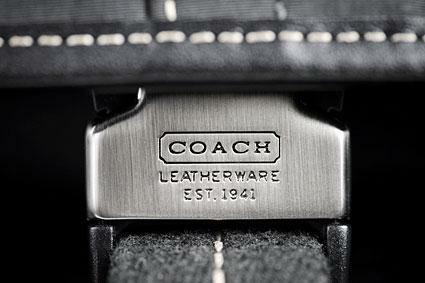 AC: At coach they appreciate and love the history of the company, I think it is because coach is an old company, and its past is so much part of its identity that people who work here are appreciative of it, I find not all companies are like that. I like that they update their regular logo jacquard and add metallic hearts or other fun patterns for younger markets. KBH: What was your background before you started the program at FIT? AC: I went to Bard college and did a program called integrated arts where you combined one of the art departments, either film or visual art, with one of the traditional disciplines. I did studio art and history. KBH: Did you have any special fields of interest while in the program? AC: I did the curatorial track and I liked looking at social roles and identities, and how people showed that through costume and fashion. I did my thesis on Inuit fashion and the way it is related to western culture. When I took the Dress in World Textiles class I found it was one of the only groups we studied that didn’t have any knit or woven textiles. It was all animal skins, and I thought that was so interesting. 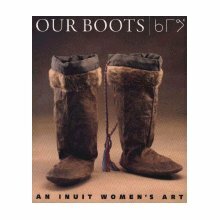 I got a book out of the library, called “Our Boots,” it was a big catalogue of Eskimo and Inuit footwear. 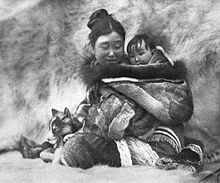 After that I saw an old silent film from the 1920s called Nanook of the North, which I loved- and I knew this would be my thesis, I wanted to know all about how they make their clothing, how it related to the environment, how in crazy, extreme condition and so little resources they made such beautiful expressive clothing. One of things I found was that in so many indigenous cultures, once they become westernized and once they start to incorporate aspects of global economy, a lot of their traditional crafts diminished, changed, or evolved so you don’t see the heritage anymore. But I found that in the case of Inuit culture that wasn’t the case, they retained a lot of culture and heritage. KBH: Why do you think? AC: I think because the environment is so extreme that when Europeans were going and trading and forming relationships with the Eskimos they would have to dress like them, or they would die. To survive they had to adopt the local dress. It is a great way to see the cultural exchange and how it evolved over time, you can even see how the culture would take western ideas but keep it very of their own mind set. KBH: Tell us about the research, where and how did you find materials? AC: It was hard to find objects and materials. Some history books include it, but there is not a lot of information about current dress. I did a lot of web research, and I actually contacted designers and companies in Canada that make traditional clothing. I also took a trip to Alaska for two weeks to visit different museums, galleries, and boutiques, and to meet designers and talk to them. In the Museum of the North, at Fairbanks, for example, I found a beautiful pair of boots a student has made. The boots looked like Converse high-tops, but they were made of local skins, and ornamented with dyed porcupine quills and beads in a pattern of a local flower. The student used a traditional appliqué technique dating back to the 1800s, it was so beautiful. I found a lot of objects where the tradition of arts and crafts technique was combined with western ideas and influences. KBH: What advice would you give to someone who just graduated from the program? AC: Not to be discouraged, even though the job market looks so challenging, stick with it, there are enough things for everyone to do. Everyone can bring something unique. This entry was posted in interviews and tagged Archives, Calvin Klein, Coach Leather, Inuit Clothing, Inuit Culture. Bookmark the permalink. I really enjoyed your post and am impressed with what you’re doing for Coach. I spent a few years after college doing consulting for corporate archives. My first reaction was echoed in your post. I was surprised by how few companies use their archives to preserve their products. There are obvious exceptions, like Kimberly-Clark has the first Kleenex box in their archives and some department stores will keep some products here and there, but more often than not, companies use their corporate archive to support communications initiatives-often internal ones. I found that corporate archives are often very different from one another, but typically consist of pictures of key executives and company events, oral history transcripts, past corporate histories, old internal corporate communications, older corporate memorabilia, any artifacts related to the founder, and occasionally old catalogs and marketing collateral, blueprints of buildings, and minutes. Just because a company is old doesn’t mean that it cares about its history. History is typically leveraged if it can support something the company is doing today. If a company’s history is of strategic value, that’s when they invest in an archive to preserve content so it can be used to support communications initiatives. Moreover, certain types of corporate communications, like corporate history books or corporate anniversary programs, are hard to execute without an archive in place to draw content from. Another good example is anything related to the founder. A company’s founder is often part of its brand, so it’s difficult to cash in on your founder’s brand if you have nothing from him to show off.